When I was a kid, the Dallas Cowboys were the perennial "bad-guys" of the NFL, and some fans did a great job of living up to those good ol' days in the hours before the team's playoff victory over the Detroit Lions. Sports fans being jerks? I know, right. Anyway, a young 10-year old Lions fan named Rowan was given tickets to the game by his grandmother, granting him a wonderful chance to cheer for his team in the Wild Card round of the playoffs. Excited for his NFL experience, he wore his Lions jersey and toured the stadium grounds prior to the game where, somehow, he wound up in a musical chairs competition hosted by a Cowboy's fan club. Grand prize of winning it all? A copy of Madden NFL 15 on the PlayStation 4. Low and behold, Rowan won the competition, but when it was discovered he was wearing a Lion's jersey, the "referee" determined that the final round needed a do-over and denied Rowan his prize. Thanks to his home-field advantage, the other boy won the second match, and despite being announced that both boys would get a copy of the game, Rowan only got a Batman DVD set and a Led Zeppelin CD. To make matters worse, his team lost the game because of equally horrible officiating from the actual NFL referees, making for a terrible, horrible, no-good, very-bad NFL experience. Luckily, Deadspin reported on this story and EA Sports stepped in like a class act to right the wrongs of these awful sport fans. 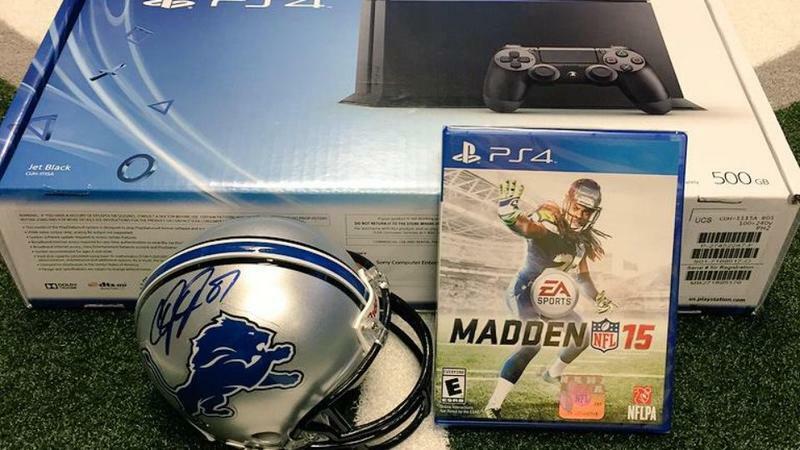 Responding to Deadspin's Twitter post, EA Sports revealed that not only would Rowan be getting a copy of Madden NFL 15, he would also be getting a brand new PlayStation 4 console AND an official replica Lions helmet signed by elite wide receiver Calvin "Megatron" Johnson himself! Not a bad set of swag. Remember sports fans, these are just games. Don't be a jerk to opposing fans, especially if they are 10-year-old boys enjoying an NFL game with their grandmother.